Speleothems are important archives of Quaternary palaeoclimate. However, climate proxies based on trace elements in speleothems are currently limited to the metals which exhibit simple partitioning (Mg2+, Sr2+, Ba2+). This study aims to expand understanding of the processes controlling the divalent first row transition metals (M2+) in these systems. Adsorptive cathodic stripping voltammetry was used to determine Cu speciation in speleothem dripwater, stream and pool samples from five limestone caves located in diverse climatic settings. Our results demonstrate that Cu binding and stabilisation by organic ligands (L) is a universal property of cave waters, which decreases the available Cu concentration ([Cu’]) by ~5 orders of magnitude relative to total Cu concentration ([CuT]). Furthermore, [Cu’] does not change meaningfully with increases in either [CuT] or [L], meaning that Cu2+ substitution in Ca2+ valence sites in precipitating CaCO3 speleothems is likely to be inhibited by organic complexation. We suggest that the residence time of speleothem thin water films (1/drip rate), the dissociation rates of labile metal-organic complexes, and the stability of adsorbed (ternary) metal-organic complexes will determine M2+ incorporation in speleothems. Figure 1 (a) Box plots of conditional stability constants (logKCuL) of CuL complexes in cave samples. Values calculated using ProMCC (Omanović et al., 2015). Error bars are 1 standard deviation. (b) Correlation between the total Cu concentration ([CuT]) and corresponding Cu ligand concentration. For all samples which plot above the 1:1 dashed diagonal line, one can assume that all available Cu is strongly complexed to organic ligands. Vertical error bars represent the fitting error in [L1]. WP = Waipuna Cave (n = 24), F = filtered, UF = unfiltered; HC = Hodges Creek Cave (n = 6); NB = Nettlebed Cave (n = 2); LXM = Mt Luxmore Caves; Daves Cave (n = 3) and Calcite Cave (n = 2). Figure 2 Available (Cu’), inorganic (CuXIN) and free (Cu2+) copper concentrations plotted against [CuT] in cave samples calculated using ProMCC (Omanović et al., 2015). [Cu’] are consistently low despite widely varying [CuT] demonstrating the dominant influence of organic ligands in these samples. Oliver, B.G., Thurman, E.M., Malcolm, R.L. (1983) The contribution of humic substances to the acidity of colored natural waters. Geochimica et Cosmochimica Acta 47, 2031-2035. Filella, M. (2009) Freshwaters: Which NOM matters? Environmental Chemistry Letters 7, 21-35. Tipping, E., Hurley, M.A. (1992) A unifying model of cation binding by humic substances. Geochimica et Cosmochimica Acta 56, 3627-3641. Warnken, K.W., Davison, W., Zhang, H., Galceran, J., Puy, J. (2007) In situ measurements of metal complex exchange kinetics in freshwater. Environmental Science and Technology 41, 3179-3185. Levy, J.L., Zhang, H., Davison, W., Galceran, J., Puy, J. (2012) Kinetic signatures of metals in the presence of suwannee river fulvic acid. Environmental Science and Technology 46, 3335-3342. Shafaei Arvajeh, M.R., Lehto, N., Garmo, Ø.A., Zhang, H. (2013) Kinetic studies of Ni organic complexes using diffusive gradients in thin films (DGT) with double binding layers and a dynamic numerical model. Environmental Science and Technology 47, 463-470. Hartland, A., Fairchild, I.J., Lead, J.R., Borsato, A., Baker, A., Frisia, S., Baalousha, M. (2012) From soil to cave: Transport of trace metals by natural organic matter in karst dripwaters. Chemical Geology 304-305, 68-82. ). However, the aforementioned research has to some extent ‘muddied the waters’, with the role of NOM often becoming equated with soil flushing in the speleothem literature and not being recognised for its pervasive influence both in metal transport and metal distribution between solution and crystal. Hartland, A., Fairchild, I.J., Lead, J.R., Zhang, H., Baalousha, M. (2011) Size, speciation and lability of NOM-metal complexes in hyperalkaline cave dripwater. Geochimica et Cosmochimica Acta 75, 7533-7551. Hartland, A., Fairchild, I.J., Müller, W., Dominguez-Villar, D. (2014) Preservation of NOM-metal complexes in a modern hyperalkaline stalagmite: Implications for speleothem trace element geochemistry. Geochimica et Cosmochimica Acta 128, 29-43. Huang, Y., Fairchild, I.J. (2001) Partitioning of Sr2+ and Mg2+ into calcite under karst-analogue experimental conditions. Geochimica et Cosmochimica Acta 65, 47-62. Day, C.C., Henderson, G.M. (2013) Controls on trace-element partitioning in cave-analogue calcite. Geochimica et Cosmochimica Acta 120, 612-627. Fairchild, I.J., Baker, A., Asrat, A., Domínguez-Villar, D., Gunn, J., Hartland, A., Lowe, D. (2012) Speleothem Science: From Process to Past Environments. Wiley-Blackwell, Chichester. ). As a model system we use Cu, which has a strong binding affinity for NOM, to demonstrate this point and present a new hypothesis on the climatic significance of transition metal variations in speleothems.
) direct from active speleothem-forming drip points (including one pool and one stream sample) in five New Zealand caves. The caves were located across a latitudinal gradient: 38 °S Waipuna Cave (n = 24; 21 drip samples, 3 stream samples), Waitomo, subtropical podocarp forest; 40 °S Nettlebed Cave (n = 2) and Hodges Creek Cave (n = 6), temperate Beech forest; and 45 °S Calcite Cave (n = 2) and Dave’s Cave (n = 3; 2 drips, 1 pool), Mt Luxmore, Fiordland, alpine tussock grassland. Unless otherwise noted drip samples were collected from actively-depositing stalactites. With the exception of Nettlebed, New Zealand’s deepest cave (889 m), developed in Ordovician marble, all other caves are developed in Oligocene shallow marine limestone. Upon collection, water samples were chilled to <4 °C, then frozen (within 48 hours) and stored at -4 °C prior to analysis. Lucia, M., Campos, A.M., van den Berg, C.M.G. (1994) Determination of copper complexation in sea water by cathodic stripping voltammetry and ligand competition with salicylaldoxime. Analytica Chimica Acta 284, 481-496. Sander, S., Kim, J.P., Anderson, B., Hunter, K.A. (2005) Effect of UVB irradiation on Cu2+-binding organic ligands and Cu2+ speciation in alpine lake waters of New Zealand. Environmental Chemistry 2, 56-62. Garnier, C., Pižeta, I., Mounier, S., Benaïm, J.Y., Branica, M. (2004) Influence of the type of titration and of data treatment methods on metal complexing parameters determination of single and multi-ligand systems measured by stripping voltammetry. Analytica Chimica Acta 505, 263-275. Sander, S.G., Koschinsky, A., Massoth, G., Stott, M., Hunter, K.A. (2007) Organic complexation of copper in deep-sea hydrothermal vent systems. Environmental Chemistry 4, 81-89. ). Once equilibrated, samples were analysed by AdCSV using a Metrohm 663 VA stand connected to a PGSTAT10 (Eco Chemie) potentiostat interfaced with GPES v4.9 software. The three electrode configuration of the system included a hanging mercury drop electrode (HMDE) as the working electrode, an Ag|AgCl|3 M KCl reference electrode, and a platinum counter electrode. The system was operated in differential pulse mode at room temperature. The deposition on a medium-sized Hg drop was set at -0.15 V for 30-180 s (deposition times varied for different samples according to their initial [CuT]), followed by a 5 s equilibrium time and a cathodic scan from -0.15 to -0.6 V at 20 mV/s. The potential step size was 5 mV, the modulation time 0.05 s, the interval time 0.1 s, and the differential pulse amplitude was 25 mV. Powell, Z. (2015) Voltammetric Studies on the Stabilisation of Dissolved Copper in Hydrothermal Vent Fluids. PhD Thesis, University of Otago. http://hdl.handle.net/10523/5413. Omanović, D., Garnier, C., Louis, Y., Lenoble, V., Mounier, S., Pižeta, I. (2010) Significance of data treatment and experimental setup on the determination of copper complexing parameters by anodic stripping voltammetry. Analytica Chimica Acta 664, 136-143.
. The inorganic side reaction coefficient (α-Cu-inorg) for Cu was adjusted for each sample separately using Visual MINTEQ 3.0 with set input variables: pH of 8.0, a temperature of 21 °C, and measured concentrations of Cu, Ca, Mg, K, Na, Cl, SO4, HCO3 and CO3. Potential inaccuracy introduced by using adjusted conditional constants for CuSA and inorganic side reaction coefficients are assumed to be fully within experimental uncertainty. ). Further, the ligand concentrations were always in excess of the total Cu concentrations ([CuT]) (Fig. 1b), indicating that all Cu was present in complexes with organic ligands. Sander, S.G., Koschinsky, A. (2011) Metal flux from hydrothermal vents increased by organic complexation. Nature Geoscience 4, 145-150. Zhao, C., Campbell, P.G.C., Wilkinson, K.J. (2016) When are metal complexes bioavailable? Environmental Chemistry 13, 425-433. Sunda, W.G., Huntsman, S.A. (1995) Regulation of copper concentration in the oceanic nutricline by phytoplankton uptake and regeneration cycles. Limnology and Oceanography 40, 132-137. Liao, J., Hu, C., Wang, M., Li, X., Ruan, J., Zhu, Y., Fairchild, I.J., Hartland, A. (2018) Assessing acid rain and climate effects on the temporal variation of dissolved organic matter in the unsaturated zone of a karstic system from southern China. Journal of Hydrology 556, 475-487. Peña, M.M.O., Koch, K.A., Thiele, D.J. (1998) Dynamic Regulation of Copper Uptake and Detoxification Genes in Saccharomyces cerevisiae. Molecular and Cellular Biology 18, 2514-2523. ), thereby contributing to the pool of Cu binding ligands in the system. Elzinga, E.J., Reeder, R.J. (2002) X-ray absorption spectroscopy study of Cu2+ and Zn2+ adsorption complexes at the calcite surface: Implications for site-specific metal incorporation preferences during calcite crystal growth. Geochimica et Cosmochimica Acta 66, 3943-3954. Lee, Y.J., Elzinga, E.J., Reeder, R.J. (2005) Cu(II) adsorption at the calcite-water interface in the presence of natural organic matter: Kinetic studies and molecular-scale characterization. Geochimica et Cosmochimica Acta 69, 49-61. Fein, J.B. (2002) The effects of ternary surface complexes on the adsorption of metal cations and organic acids onto mineral surfaces. In: Hellmann, R., Wood, S.A. (Eds.) Water-Rock Interactions, Ore Deposits and Environmental Geochemistry: A Tribute to David A. Crerar. The Geochemical Society, Special Publication No. 7, 365-378. Schott, J., Mavromatis, M., González-González, A., Oelkers, E.H. (2014) Kinetic and thermodynamic controls of divalent metals isotope composition in carbonate: Experimental investigations and applications. Procedia Earth and Planetary Science 10, 168-172.
) (Fig. 3). With the exception of sub-aqueous calcite deposition (typically characterised by very long water residence times), the time available for dissociation is the residence time of the crystallising fluid, which may be approximated by the interval between drips. This opens the possibility of reconstructing the palaeo-discharge of speleothem dripwaters based on the metal accumulation (and metal isotope fractionation) patterns of speleothems (if the dissociation rate constants of metal-organic complexes and fractionation factors can be determined (Fig. 3)). We have shown that dissolved ligands (<0.2 µm) are the primary agents controlling the speciation of Cu in speleothem-forming cave waters. Indeed, complexation by strong binding ligands drives consistently low concentrations of [Cu’] despite widely varying [CuT]. We argue that dominant organic complexation of divalent transition metals (e.g., Ni2+, Co2+, Cu2+, and Zn2+) and other metals able to bind to organic ligands (e.g., Cd2+and Pb2+) in the ‘aqueous sink’ leads to a range of signals in speleothems controlled by the dissociation rates of these complexes, the residence time of the dripwaters (1/drip rate) and the compatibility of M2+ in lattice valence sites. Through this study we aim to increase awareness in the speleothem community of the central importance of metal complexation by organic ligands for understanding trace element signals in speleothems. Future research should aim at understanding the significance of these processes for speleothem palaeoclimate records, and the geomicrobiology of karst environments. This research was enabled by Marsden Fund grant (UOW1403) and Rutherford Discovery Fellowship (RDF-UOW1601) to AH., and a PhD scholarship from the University of Otago to RZ. Graphical abstract image provided by Garry K. Smith. Thus, it is not appropriate to interpret the changing concentration of transition metals in dripwaters (and by extension speleothems) in terms of simple partitioning (as is routinely and correctly done with regard to the alkaline earth metals (Huang and Fairchild, 2001; Day and Henderson, 2013)). From a review of the literature, the evidence suggests that Cu2+ adsorption to calcite is favoured (Elzinga and Reeder, 2002) but inhibited by formation of solution complexes with organic ligands (Lee et al., 2005), i.e. the ‘aqueous sink’ (Fig. 3). We can expect that the rapid adsorption (Elzinga and Reeder, 2002; Lee et al., 2005) of newly dissociated Cu2+ to the calcite surface (i.e. 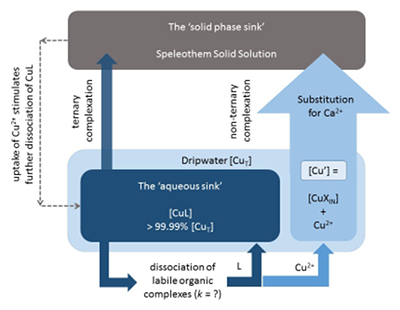 the ‘solid phase sink’) will further drive this dissociation process, likely profoundly changing the resulting stable metal isotope fractionation compared with inorganic laboratory experiments (Schott et al., 2014) (Fig. 3). The aim of this paper is to establish the fact that metal binding by NOM ligands in the waters that form speleothems dictates that the activity of [M’] << [MT]; and therefore, the formation of CaCO3/Ca(M)CO3 solid solutions cannot be treated using partition coefficients unless the role of organic ligands is properly accounted for (Fairchild et al., 2012). Aside from the significance of this finding for trace element signals in speleothems (Fairchild et al., 2012), this finding also has significance for geomicrobiology because at biologically available Cu concentrations (Zhao et al., 2016) below 10−15 M, Cu is an inhibitor (e.g., microbial activity/growth) for some marine microorganisms (Sunda and Huntsman, 1995). Previous experimental work (Lee et al., 2005) also indicates that ternary (metal-organic) complexes (Fein, 2002) at the calcite surface have lower stabilities than non-ternary complexes, and this is supported by empirical evidence showing large increases in the metal/NOM ratio between dripwaters and speleothems (Hartland et al., 2014). The pervasiveness of natural organic matter (NOM) in aquatic systems has been established for decades (Oliver et al., 1983; Filella, 2009). This step was followed by increasing Cu additions (ranging from 0 to 300 nM), calculated as a geometrically spaced series (i.e. logarithmic scale) (Garnier et al., 2004), of a known Cu standard (Fisher Scientific, prepared by dilution of a 15.74 mM atomic absorption Cu standard in 1 % quartz distilled HCl) to the 12 aliquots (Sander et al., 2007). While organic complexation is very important for transmission of metals in karst aquifers (Hartland et al., 2011), strong binding of metals by NOM also creates an ‘aqueous sink’ for divalent metal ions which is likely to inhibit M2+ substitution for Ca2+ in calcite lattice sites (Hartland et al., 2014). Samples of cave water were collected in acid washed, low density polyethylene (LDPE) bottles (Hartland et al., 2011) direct from active speleothem-forming drip points (including one pool and one stream sample) in five New Zealand caves. This indicates the presence of organic ligands in the size fraction above 0.2 μm, consistent with previous studies which identified Cu associated with coarse colloidal NOM in cave systems (Hartland et al., 2011, 2012). The transport of metals by colloidal and dissolved NOM has been shown to be important in shallow near surface systems (Hartland et al., 2012). Further, logKCuL values generally increased between unfiltered and filtered samples, which suggests that Cu complexes with nano-scale organic ligands are slightly more stable than Cu complexes with colloids > 0.2 µm (Hartland et al., 2012). We also note that [L] was uncorrelated with the total organic carbon (TOC) concentration – dripwater TOC mainly correlates with soil-derived organic matter based on numerous fluorescence studies (Liao et al., 2018) - in the samples (Fig. S-1), and therefore cannot exclude the possibility that microbes in cave systems secrete ligands in order to regulate copper bioavailability (Peña et al., 1998), thereby contributing to the pool of Cu binding ligands in the system. It is possible to classify different metals according to their NOM binding affinity, with Cu and Ni showing particularly high binding strength among the transition metals (Warnken et al., 2007; Levy et al., 2012). To determine Cu speciation parameters Adsorptive Cathodic Stripping Voltammetry (AdCSV) with salicylaldoxime (SA) was used as the synthetic complexing agent (Lucia et al., 1994). Conditional stability constants (input data for ProMCC) of the CuSAx-complex of the samples were adjusted according to the approach of Lucia et al. (1994). After completion of the titration, the ProMCC software (Omanović et al., 2010) was used to calculate conditional formation constants (K), Cu-binding ligand concentrations ([L]), and [Cu’] (sum of [Cu2+] and [CuXIN]) of each solution. Figure 1 [...] Values calculated using ProMCC (Omanović et al., 2015). 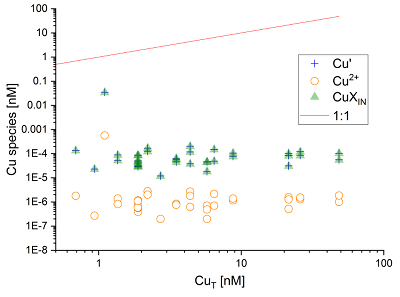 Figure 2 Available (Cu’), inorganic (CuXIN) and free (Cu2+) copper concentrations plotted against [CuT] in cave samples calculated using ProMCC (Omanović et al., 2015). All sample handling and electrochemical measurements were conducted inside a clean air bench following trace metal clean procedures (Sander et al., 2005; Powell, 2015). The determined stability constants indicate Cu complexation with organic ligands, such as thiols, carboxylic acids, hydroxyl and amine functional groups, which have very high stability constants (logKCuL of 14-16) (Sander and Koschinsky, 2011). Finally, samples were left to equilibrate for a minimum of 12 hours, which was found to result in stable Cu-SA peaks (Sander et al., 2007). CuXIN is considered to be labile because the stability of inorganic transition metal complexes (which dissociate rapidly in the presence of a suitable sink) is much lower than metal-organic complexes (which dissociate much more slowly (Shafaei Arvajeh et al., 2013)). Equally well established is the interaction between trace metals and NOM ligands, which dominates metal speciation and bioavailability in aquatic environments with pH values typical of cave waters (pH ~8) (Tipping and Hurley, 1992). If we accept that the inorganic pathway (i.e. Cu2+ substitution) is the dominant mechanism for Cu incorporation in speleothems, it follows that under conditions of continuous calcite precipitation, Cu2+ adsorption to calcite will proceed at the rate dictated by the kinetics of CuL dissociation (Warnken et al., 2007).